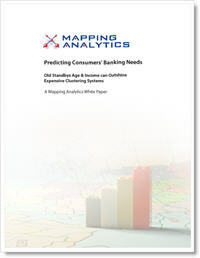 Many banks use sophisticated and expensive lifestyle clustering systems to predict consumer buying behavior. Yet key indicators of a consumer's banking needs often can be boiled down to three life stage factors: age, income, and family status. .
Download "Prediciting Consumers' Banking Needs"
"More than just maps, they gave us the tools that helped us grow our business."